PORT-AU-PRINCE – Out of sight, out of mind, the familiar proverb goes. The people of Haiti know this; they live this. After the 2010 earthquake that decimated the country, killing some 316,000 Haitians and leaving some one million homeless, an influx of outside aid poured into the country. Today, much of that promised money has yet to materialize, and most aid groups have vacated. Haiti still remains the poorest and most disease-ravaged country in the Western Hemisphere. By establishing telemedicine clinics and extending care to Haitians in the most rural and forgotten areas, the endeavors of one group seek to put Haiti back into sight and back into minds – for good. Elaine Knight, founder and chair of LifePaths Global Alliance (LGA), an organization seeking to sustainably help disadvantaged communities, both locally and internationally, decided to act. 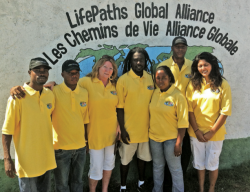 In 2010, Knight helped establish a telemedicine clinic based in L'Estere, Haiti – two hours north of Port-au-Prince. Two years later, the telemedicine clinic has provided healthcare to more than 10,000 Haitians and has helped decrease malaria, sexually transmitted diseases and basic infections by 30 percent. Knight says the efforts began after the 2010 earthquake, when she decided to take a group of physiotherapists down to help the inordinate number of amputees. When the group arrived, Knight says, "We found very quickly that we couldn't find a lot of the amputees, and the amputees couldn't really find us because they were in tent cities and were dispersed all over the place." It was then the group decided to connect with Joseph Prosper, Haitian doctor and telemedicine clinic medical director, who conducted rural mobile health clinics across the country. "We didn't just come here for the earthquake, and we won't leave when it is forgotten," says Prosper in a 2010 NJ.com article. Knight recalls the story of a young pregnant woman who needed emergency medical care, but because of her rural location, there was absolutely no place to take her. Eight hours later, the woman died. Tragedies like this are everyday facts of life, Knight says somberly. "Had someone showed up an hour after the accident, many of those people would still be alive." "I quickly decided that the best solution to the problem in Haiti would be the basic healthcare," she says. In Port-au-Prince, "Everybody was trying to help with the earthquake, but what was really important, I thought, was to bring services out to the rural areas." January 2011, Knight's group went full-on telemedicine. "On Wednesdays and Saturdays we would hold clinics, and people would come into our clinics, and we would hook them up by video to our doctor in Port-au-Prince, and he would talk to them about what problems they were having." There would be one agent with the patient, and the doctor would discuss among the three of them what the symptoms were and what he thought would be the best method for treatment. The doctor would then authorize the agent to write out a prescription to take to LGA's free pharmacy. Some 100 patients per week were given primary care this way.